by Thomas Phillips, ca. 1835. British poet, Lord George Gordon Byron (1788-1824), set out on a grand tour of the Mediterranean in 1809, in the course of which he visited Spain, Malta, Albania, Greece and Asia Minor. 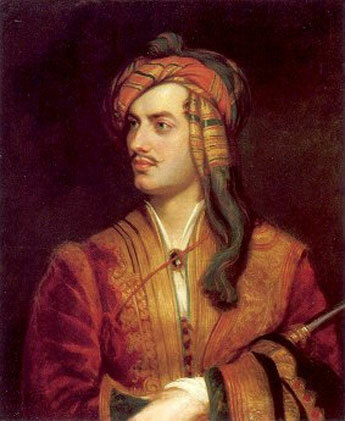 His visit to Albania in the autumn of that year made a lasting impression on him and is reflected in the second canto of the poem "Childe Harold's Pilgrimage," that catapulted him to fame as a writer in 1812. The first letter here, written to his mother from Albania, betrays much of the excitement he felt on his first journey to the "Orient" and, in particular, at his meeting with the formidable tyrant Ali Pasha of Tepelena (1744-1822), the so-called Lion of Janina. 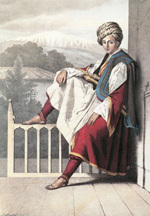 The second letter, written to John Cam Hobhouse (1786-1869), describes his encounter with Veli Pasha, son of Ali Pasha. I have now been some time in Turkey. The place is on the coast but I have traversed the interior of the province of Albania on a visit to the Pacha. I left Malta in the Spider, a brig of war, on the 21st of September and arrived in eight days at Prevesa. I thence have been about 150 miles as far as Tepaleen, his highness' country palace, where I staid three days. The name of the Pacha is Ali, and he is considered a man of the first abilities, he governs the whole of Albania (the ancient Illyricum), Epirus and part of Macedonia. 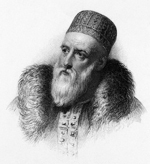 His son Velly Pacha, to whom he has given me letters, governs the Morea and he has great influence in Egypt, in short he is one of the most powerful men in the Ottoman empire. When I reached Yanina the capital after a journey of three days over the mountains through country of the most picturesque beauty, I found that Ali Pacha was with his army in Illyricum besieging Ibraham Pacha in the castle of Berat. He had heard that an Englishman of rank was in his dominion and had left orders in Yanina with the Commandant to provide a house and supply me with every kind of necessary, gratis, and though I have been allowed to make presents to the slaves etc. I have not been permitted to pay for a single article of household consumption. I rode out on the vizier's horses and saw the palaces of himself and grandsons; they are splendid but too much ornamented with silk and gold. I then went over the mountains through Zitza, a village with a Greek monastery (where I slept on my return) in the most beautiful situation (always excepting Cintra in Portugal) I ever beheld. In nine days I reached Tepaleen, our journey was much prolonged by the torrents that had fallen from the mountains and intersected the roads. I shall never forget the singular scene on entering Tepaleen at five in the afternoon as the sun was going down, it brought to my recollection (with some change of dress however) Scott's description of Branksome Castle in his lay, and the feudal system. I was conducted to a very handsome apartment and my health enquired after by the vizier's secretary "a la mode de Turque." The next day I was introduced to Ali Pacha. I was dressed in a full suit of staff uniform with a very magnificent sabre etc. The Vizier received me in a large room paved with marble, a fountain was playing in the centre, the apartment was surrounded by scarlet Ottomans, he received me standing, a wonderful compliment from a Mussulman, and made me sit down on his right hand. I have a Greek interpreter for general use, but a Physician of Ali's named [Seculario?] who understands Latin acted for me on this occasion. His first question was why at so early an age I left my country? (the Turks have no idea of travelling for amusement). He then said the English Minister, Capt. Leake, had told him I was of a great family, and desired his respects to my mother, which I now in the name of Ali Pacha present to you. He said he was certain I was a man of birth because I had small ears, curling hair, and little white hands, and expressed himself pleased with my appearance and garb. He told me to consider him as a father whilst I was in Turkey, and said he looked on me as his son. Indeed he treated me like a child, sending me almonds and sugared sherbet, fruit and sweetmeats twenty times a day. He begged me to visit him often, and at night when he was more at leisure. I then after coffee and pipes retired for the first time. I saw him thrice afterwards. It is singular that the Turks who have no hereditary dignities and few great families except the Sultan's pay, so much respect to birth, for I found my pedigree more regarded than even my title. His Highness is sixty years old, very fat and not tall, but with a fine face, light blue eyes and a white beard, his manner is very kind and at the same time he possesses that dignity which I find universal amongst the Turks. He has the appearance of anything but his real character, for he is a remorseless tyrant, guilty of the most horrible cruelties, very brave and so good a general, that they call him the Mahometan Buonaparte. Napoleon has twice offered to make him King of Epirus, but he prefers the English interest and abhors the French as he himself told me. He is of so much consequence that he is much courted by both, the Albanians being the most warlike subjects of the Sultan, though Ali is only nominally dependent on the Porte. He has been a mighty warrior, but is as barbarous as he is successful, roasting rebels etc. etc. Bonaparte sent him a snuffbox with his picture. He said the snuffbox was very well, but the picture he could excuse, as he neither liked it nor the original. His ideas of judging of a man's birth from ears, hands etc. were curious enough. To me he was indeed a father, giving me letters, guards, and every possible accommodation. Our next conversations were of war and travelling, politics and England. He called my Albanian soldier who attends me, and told him to protect me at all hazards. His name is Viscillie and like all the Albanians, he is brave, rigidly honest, and faithful, but they are cruel though not treacherous, and have several vices, but no meannesses. They are perhaps the most beautiful race in point of countenance in the world, their women are sometimes handsome also, but they are treated like slaves, beaten and in short complete beasts of burthen, they plough, dig and sow, I found them carrying wood and actually repairing the highways. The men are all soldiers, and war and the chase their sole occupations. The women are the labourers, which after all is no great hardship in so delightful a climate. Today I saw the remains of the town of Actium near which Anthony lost the world in a small bay where two frigates could hardly manoeuvre, a broken wall is the sole remnant. On another part of the gulph stand the ruins of Nicopolis built by Augustus in honour of his victory. Last night I was at a Greek marriage, but this and 1000 things more I have neither time or space to describe. I am going tomorrow with a guard of fifty men to Patras in the Morea, and thence to Athens where I shall winter. Two days ago I was nearly lost in a Turkish ship of war owing to the ignorance of the captain and crew though the storm was not violent. Fletcher yelled after his wife, the Greeks called on all the Saints, the Mussulmen on Alla, the Captain burst into tears and ran below deck telling us to call on God, the sails were split, the mainyard shivered, the wind blowing fresh, the night setting in, and all our chance was to make Corfu which is in possession of the French, or (as Fletcher pathetically termed it) "a watery grave." I did what I could to console Fletcher but finding him incorrigible, wrapped myself up in my Albanian capote (an immense cloak) and lay down on deck to wait the worst. I have learnt to philosophize on my travels, and if I had not, complaint was useless. Luckily the wind abated and only drove us on the coast of Suli on the main land where we landed and proceeded by the help of the natives to Prevesa again; but I shall not trust Turkish sailors in future, though the Pacha had ordered one of his own galleots to take me to Patras. I am therefore going as far as Missolonghi by land and there have only to cross a small gulph to get to Patras. Fletcher's next epistle will be full of marvels. We were one night lost for nine hours in the mountains in a thunder storm, and since nearly wrecked. In both cases Fletcher was sorely bewildered, from apprehensions of famine and banditti in the first, and drowning in the second instance. His eyes were a little hurt by the lightning or crying (I don't know which) but are now recovered. When you write address to me at Mr. Strané's English Consul, Patras, Morea. I could tell you I know not how many incidents that I think would amuse you, but they crowd on my mind as much as would swell my paper, and I can neither arrange them in the one, or put them down on the other, except in the greatest confusion and in my usual horrible hand. I like the Albanians much, they are not all Turks, some tribes are Christians, but their religion makes little difference in their manner or conduct; they are esteemed the best troops in the Turkish service. I lived on my route two days at once, and three days again in a Barrack at Salora, and never found soldiers so tolerable, though I have been in the garrisons of Gibraltar and Malta and seen Spanish, French, Sicilian and British troops in abundance. I have had nothing stolen, and was always welcome to their provision and milk. Not a week ago, an Albanian chief (every village has its chief who is called Primate) after helping us out of the Turkish galley in her distress, feeding us and lodging my suite consisting of Fletcher, a Greek, two Albanians, a Greek priest and my companion Mr. Hobhouse, refused any compensation but a written paper stating that I was well received, and when I pressed him to accept a few sequins, "no," he replied, "I wish you to love me, not to pay me." These were his words. It is astonishing how far money goes in this country, while I was in the capital, I had nothing to pay by the vizier's order, but since, though I have generally had sixteen horses and generally six or seven men, the expence has not been half as much as staying only three weeks in Malta, though Sir A. Ball, the governor, gave me a house for nothing, and I had only one servant. By the bye I expect Hanson to remit regularly, for I am not about to stay in this province for ever, let him write to me at Mr. Strané's, English Consul, Patras. P.S. I have some very "magnifique" Albanian dresses, the only expensive articles in this country. They cost 50 guineas each and have so much gold they would cost in England two hundred. I have been introduced to Hussein Bey, and Mahmout Pacha, both little boys, grandchildren of Ali at Yanina. They are totally unlike our lads, have painted complexions like rouged dowagers, large black eyes and features perfectly regular. They are the prettiest little animals I ever saw, and are broken into the court ceremonies already. The Turkish salute is a slight inclination of the head with the hand on the breast, intimates always kiss. Mahmout is ten years old and hopes to see me again, we are friends without understanding each other, like many other folks, though from a different cause. He has given me a letter to his father in the Morea, to whom I have also letters from Ali Pacha. I am on the rack of setting off for Argos amidst the usual creaking, swearing, loading and neighing of sixteen horses and as many men serving us included. You have probably received one letter dated Patras and I send this at a venture. Velly Pacha received me even better than his Father did, though he is to join the Sultan, and the city is full of troops and confusion, which as he said, prevents him from paying proper attention. He has given me a very pretty horse and a most particular invitation to meet him at Larissa, which last is singular enough as he recommended a different route to Ld. Sligo who asked leave to accompany him to the Danube. I asked no such thing, but an his enquiring where I meant to go, and receiving for answer that I was about to return to Albania for the purpose of penetrating higher up the country, he replied, "no you must not take that route, but go round by Larissa where I shall remain some time an my way. I will send to Athens, and you shall join me, we will eat and drink well, and go a hunting." He said he wished all the old men (specifying under that epithet North, Forresti, and Strané) to go to his father, but the young ones to come to him, to use his own expression "vecchio con vecchio, giovane con giovane." He honored me with the appellations of his friend and brother, and hoped that we should be an good terms not for a few days but for life. All this is very well, but he has an awkward manner of throwing his arm round one's waist, and squeezing one's hand in public, which is a high compliment, but very much embarrasses "ingenuous youth". The first time I saw him he received me standing, accompanied me at my departure to the door of the audience chamber, and told me I was a palikar (young brave) and an eumorpho paidi (beautiful boy). He asked if I did not think it very proper that as young men (he has a beard down to his middle) we should live together, with a variety of other sayings, which made Strané stare, and puzzled me in my replies. He was very facetious with Andreas and Viscillie, and recommended that my Albanians' heads should be cut off if they behaved ill. I shall write to you from Larissa, and inform you of our proceedings in that city. In the mean time I sojourn at Athens. I have sent Eustathius back to his home, he plagued my soul out with his whims, and is besides subject to epileptic fits (tell Matthews this) which made him a perplexing companion, in other matters he was very tolerable, I mean as to his learning, being well versed in the Ellenics. You remember Nicolo at Athens Lusieri's wife's brother. Give my compliments to Matthews from whom I expect a congratulatory letter. P.S. You knew young Bossari at Yanina, he is a piece of Ali Pacha's!! Well did Horace write nil admirari.